Kyôhô era: as an actor, he performs in Edo under the name of Sawamura Chôsaku. He is the disciple of Sawamura Sôjûrô I. He has a family relationship with the playwright Fujimoto Heizaemon. He also works as a sakusha, using first the name of Fujimoto Tobun then the name of Sawamura Tobun at the end of the Kyôhô era. 11th lunar month of 1735: Tobun works at the Nakamuraza, along with Tsuuchi Kuheiji I, on kaomise drama "Tono Zukuri Shinoda Zuma". 1737: he takes back the name of Fujimoto Tobun. 11th lunar month of 1737: Tobun works at the Kawarasakiza on the kaomise drama "Urûzuki Ninin Kagekiyo". The final act of this play is a spectacular confrontation scene between Ichikawa Ebizô II and Ichikawa Danzô I in the roles of the statue of Kan U and the statue of Chô Hi (Kan U and Chô Hi were two legendary Chinese generals). 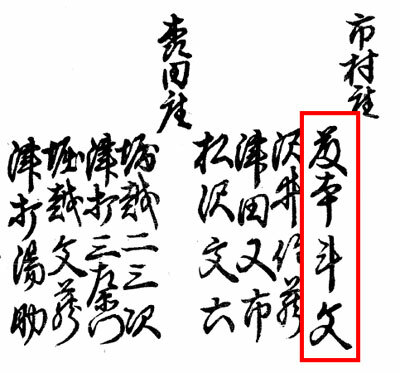 This is the first version of "Kan U", which will become part of the Kabuki Jûhachiban in 1840. 11th lunar month of 1739: Tobun works at the Ichimuraza on the kaomise drama "Tokiwagi Taiheiki". 2nd lunar month of 1740: premiere at the Ichimuraza of the play "Sugatami Sumidagawa". The nibanme of this new year drama is "Nanatsu Men" ("Seven Masks"), which now belongs to the Kabuki Jûhachiban. This performance is a triumphant success. 11th lunar month of 1740: Tobun works at the Nakamuraza on the kaomise drama "Miya Bashira Taiheiki", which celebrates the shûmei of Ichikawa Danzô III and Tomizawa Tatsujûrô. 1st lunar month of 1741: Tobun works in the same theater on the new year sogamono "Na no Hana Akebono no Soga". 11th lunar month of 1742: Tobun works at the Ichimuraza, along with Tsuuchi Jihê II, Tsuuchi Kuheiji I and Tsuuchi Hanjûrô, on the kaomise drama "Furisode Shinoda no Zuma", which welcomes in Edo the Kamigata actor Onoe Kikugorô I and stars Bandô Hikosaburô I, Segawa Kikunojô I, Ichimura Uzaemon VIII, Bandô Matatarô III, Nakajima Mihoemon I, Ichikawa Sôzaburô I, Tomizawa Tatsujûrô, Tamazawa Saijirô I, Sawamura Utagiku, Ichimura Manzô and Sanogawa Senzô. 1st lunar month of 1743: Tobun works in the same theater on the new year sogamono "Haru no Akebono Kuruwa Soga". 11th lunar month of 1743: Tobun works at the Nakamuraza, along with Hayakawa Denshirô, on the kaomise drama "Funayosooi Mitsugi Taiheiki", which celebrates the shûmei of Ôtani Oniji I. 11th lunar month of 1749: Tobun works at the Ichimuraza, along with Horikoshi Nisôji and supported by Tsuuchi Sanzaemon, Tsuuchi Eisuke and Tsuda Mataichi, on the kaomise drama "Yoritomo Gunbai Kagami". 1st lunar month of 1750: Tobun works in the same theater on the new year sogamono "Kayôkami Chidori Soga". 11th lunar month of 1750: Tobun works at the Ichimuraza, supported by Sawai Chûzô, Matsuzawa Bunroku and Tsuda Mataichi, on the kaomise drama "Gaijin Taiheiki", which celebrates the shûmei of Arashi Sanpachi I. 2nd lunar month of 1751: Tobun works in the same theater on the new year drama "Hatsuhana Sumidagawa", which includes the "Uirô Uri" scene. 11th lunar month of 1751: Tobun works at the Ichimuraza, supported by Sawai Chûzô, Matsuzawa Bunroku and Tsuuchi Kyôshichi, on the kaomise drama "Kamimukae Nigiwai Genji", which celebrates the shûmei of Bandô Hikosaburô II and welcomes in Edo the Kamigata actor Arashi Shichigorô I. 1st lunar month of 1752: Tobun works in the same theater on the new year sogamono "Suzuriha Sugatami Soga". 11th lunar month of 1752: Tobun works for the tatesakusha Horikoshi Nisôji (who is about to leave Edo to go to Kyôto) at the Nakamuraza, along with Sawai Chûzô and Matsuzawa Bunroku, on the kaomise drama "Akazawayama Sumô Nikki". 1st lunar month of 1753: Tobun works in the same theater on the new year sogamono "Otokodate Hatsugai Soga" . 1st lunar month of 1753: premiere at the Nakamuraza of the dance-drama "Kyôganoko Musume Dôjôji". The leading role of this dance is played by the great star Nakamura Tomijûrô I. The performance's success is beyond expectation and the performances are extended for several months. 11th lunar month of 1753: Tobun works at the Nakamuraza, supported by Sawai Chûzô, Matsuzawa Bunroku and Nakamura Seizaburô II, on the kaomise drama "Hyakumanki Tsuwamono Taiheiki", which celebrates the shûmei of Ichikawa Masuzô I. 1st lunar month of 1754: Tobun works in the same theater on the new year sogamono "Momo Chidori Kuruwa Soga", which includes the "Ya-no-Ne" scene (presented to the audience as a once-in-a-lifetime performance of Ichikawa Ebizô II) and commemorates the 12th anniversary (13th memorial service) of the death of Ichikawa Danjûrô III. This performance is a triumphant success and is extended up to the 6th lunar month. 11th lunar month of 1755: Tobun works at the Ichimuraza on the kaomise drama "Kashiwagatôge Kichirei Sumô". 3rd lunar month of 1756: Tobun works in the same theater on the drama "Umewakana Futaba Soga". No record afterwards. Fujimoto Tobun was an important Edo sakusha who was active from the end of the Kyôhô era to the second half of the 1750s. He was the author of the lyrics of "Musume Dôjôji", the most famous dance-drama in Kabuki history. He worked on more than 65 original dramas. This drama was revived in January 1973 at the National Theatre!